Turnaspidogy Stone Row, Co Cork. Photo credit Wikipedia. Irish grid reference: W1876 6696. 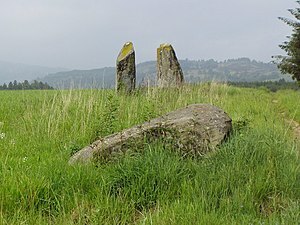 Three prehistoric stones together in a field just to the east of the Currahy road near the hamlet of Turnaspidogy (Tir Na Spideoga). The stones are a bit difficult to find at the best of times, but they can be found a little to the east of a farm building on a flat area of land where the land slopes gently away. A few miles to the south is Lough Allua, while the nearest town is Dunmanway 9 miles to the south-east. Another name for this ancient site is sometimes given as ‘the Cult Stones’. The three stones stand on a low mound and are roughly aligned north to south. Originally they would have formed a stone row though any other stones, if there were any, have been robbed away to the locality to be used as gate-posts, perhaps? Farming has more or less destroyed the site. One of the stones has sadly now fallen over, but this would have been the tallest of the three at 2.4 metres in length. The other two stones stand between just under 1 metre to 1.7 metres in height. Neolithic people would have erected these stones on an alignment to mark a lunar event on the horizon, but probably not a solar event, as is sometimes the case. Categories: Stone Row, Turnaspidogy Stone Row Co Cork | Tags: Turnaspidogy Stone Row in Co. Cork Southern Ireland | Permalink.